If you’re like me, some of your favorite childhood memories are of Halloween. You get to dress up like someone or something else, go to strangers’ houses and ask them for treats, cause a little mischief and binge on candy. But the best thing about Halloween? There’s a lot of social psychology at work. Norms: Usually, if you knocked on someone’s door at night dressed as a blood-sucking Zombie demanding candy, people would freak out and call the police. But on Halloween, this would be expected, and norms would be altered for the night. You might even be called a party pooper if you don’t make an effort to dress in costume. These kinds of social norms have long been of interest to social psychologists. Descriptive norms are social rules transmitted by others; so when you show up to the Halloween party as the only one in costume, all of a sudden, you feel out of place, even though you would fit in at a more festive party.5 Injunctive norms speak to what should be done, or what is socially endorsed, i.e. you should go to the party in costume because you are supposed to wear a costume on Halloween.5 Social norms are often positive, but they can also lead to higher levels of conformity, riskier decisions and worse decisions through consensus.6,7,8,9 Norms are also at work when people throw costume parties, visit the pumpkin patch or go to haunted houses. Not only does the seasonal social acceptance of the activity encourage us to partake in some strange stuff, our desire to act in accordance with norms is a billion dollar industry ($11.3 to be exact). It’s clear that our Halloween traditions involve social psychology, from the norms in place that dictate our Halloween activities, the anonymity that allows for increased mischief, and the prosocial nature of some of our Halloween traditions. So this Friday, put your SocialPsyQ to work! What are some social psychology phenomena you see on Halloween? * Deindividuation is the loss of self-awareness in groups. Postmes, T., Spears, R., Sakhel, K., & de Groot, D. (2001). Social influence in computer-mediated communication: The effects of anonymity on group behavior. Personality and Social Psychology Bulletin, 27(10), 1243-1254. Diener, E., Fraser, S. C., Beaman, A. L., & Kelem, R. T. (1976). 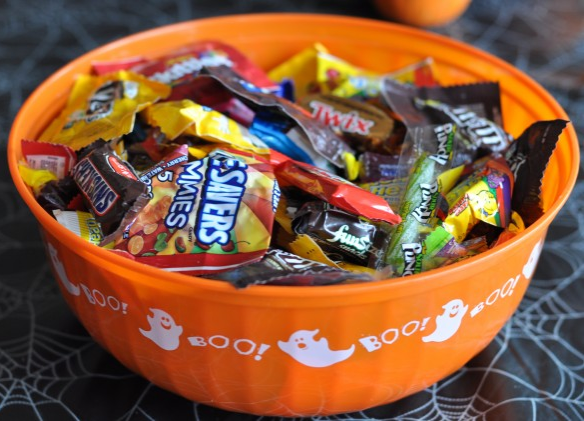 Effects of deindividuation variables on stealing among Halloween trick-or-treaters. Journal of Personality and Social Pschology, 33(2), 178-183. Cialdini, R. B., & Trost, M. R. (1998). Social influence: Social norms, conformity and compliance. In D. T. Gilbert, S. T. Fiske, & L. Gardner (Eds). The handbook of social psychology, Vols. 1 and 2 (4th ed. ), (pp. 151-192). New York, NY, US: McGraw-Hill. Sherif, M. (1937). An experimental approach to the study of attitudes. Sociometry, 1(1/2), 90-98. Asch, S. E. (1956). Studies of independence and conformity: I. A minority of one against a unanimous majority. Psychological Monographs: General and Applied, 70(9), 1-70. Stoner, J. A. F. (1968). Risky and cautious shifts in group decisions: The influence of widely held values. Journal of Experimental Social Psychology, 4(4), 442-459. Postmes, T., Spears, R., & Cihangir, S. (2001). Quality of decision making and group norms. Journal of Personality and Social Psychology, 80(6), 918-930. Puffer, S. M. (1987). Prosocial behavior, noncompliant behavior, and work performance among commission salespeople. Journal of Applied Psychology, 72(4), 615-621. Denham, S. A. (1986). Social cognition, prosocial behavior, and emotion in preschoolers: Contextual validation. Child Development, 57(1), 194-201. Eisenberg, N., & Miller, P. A. (1987). The relation of empathy to prosocial and related behaviors. Psychological Bulletin, 101(1), 91-119.